As you enter, our upstairs end unit you immediately notice the view overlooking the lake on the golf course and our open floor plan. The comfortable living room, invites you to sit down and relax. 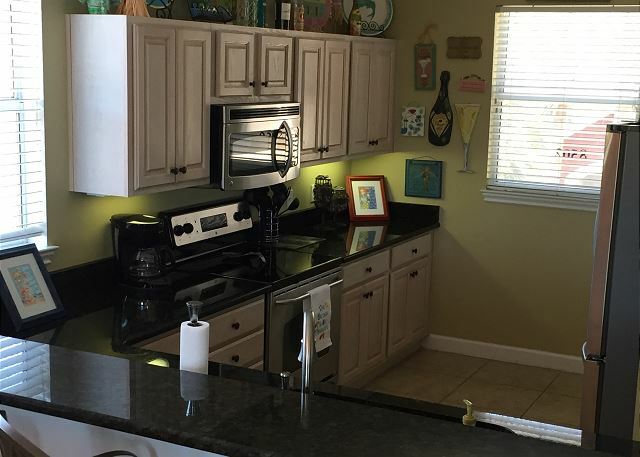 The well laid out kitchen has all the tools you need to prepare a quick breakfast, family meal or a shrimp boil for family and friends. The dining area is ample. The patio off the living/dining area is generous- perfect for enjoying the outdoors, reading a book, or enjoying a cold beverage. 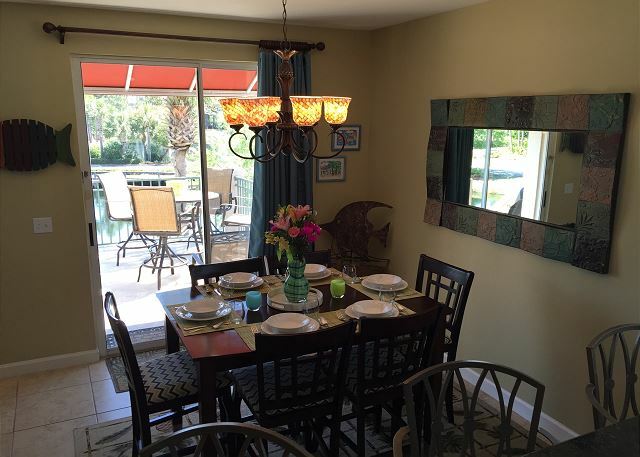 Steps from the patio take you to the lush grounds and stocked lake for catch and release fishing. The open living, dining and kitchen area with balcony is perfect for relaxing or creating memories with family and friends. 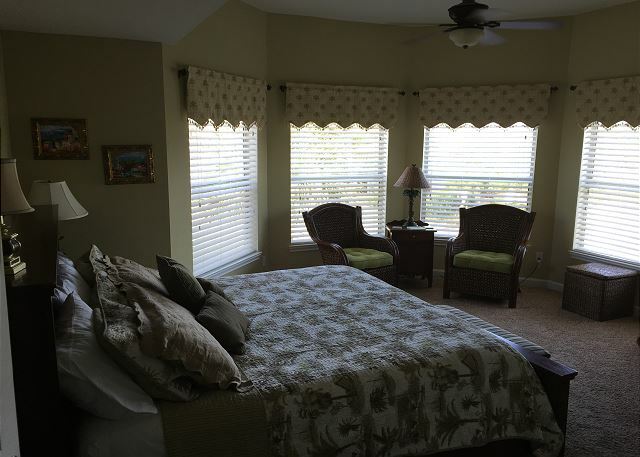 The second floor offers a large master bedroom with windows overlooking the lake and attached master bath. 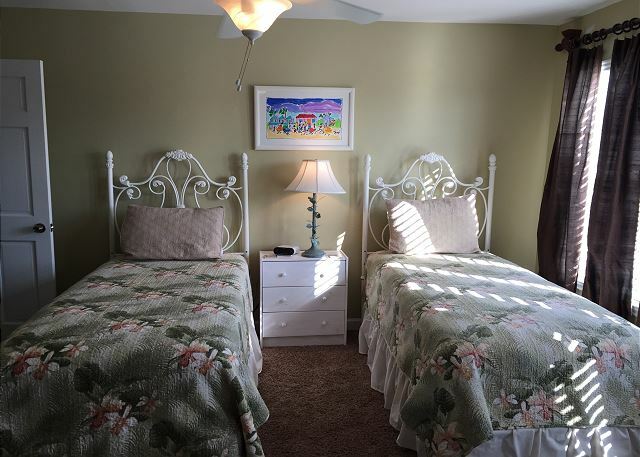 The second bedroom offers a queen bed and the 3rd bedroom has two twin beds. 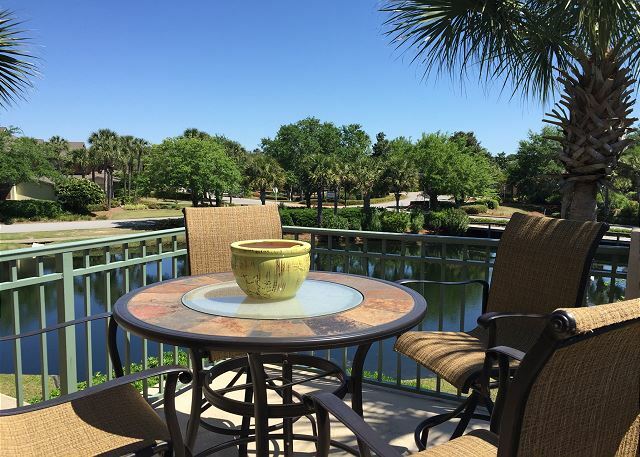 The Village, tennis courts, and marina are just a short stroll from this condo. The neighborhood pool is just steps away. Well behaved pets are welcome. 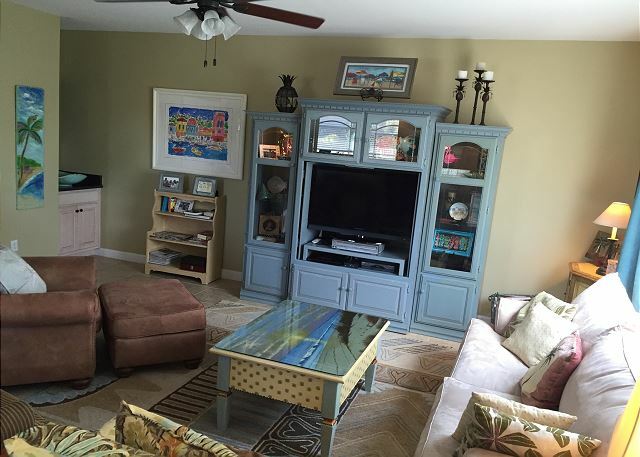 Very nice townhome located just a short walk to the Village of Baytown Wharf. 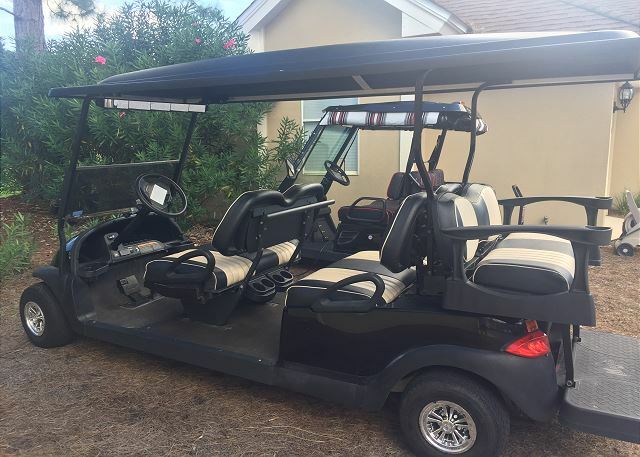 The golf cart makes it easy to travel around the resort. Terry, Thank you for the review. 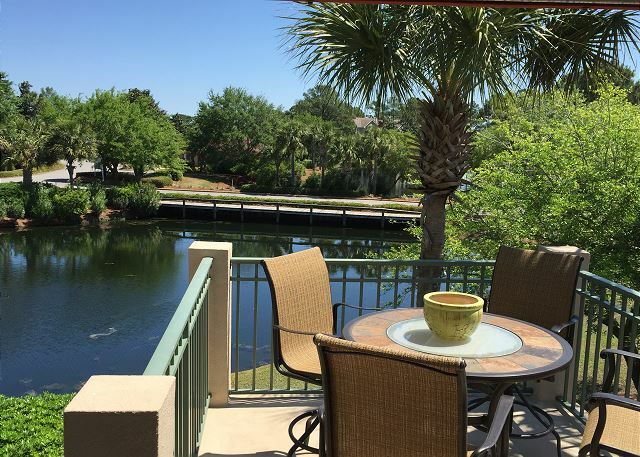 This townhouse was perfectly located walking distance to Baytowne Wharf and a short drive to any of the nearby beaches. The townhouse itself was beautiful! Perfect size to fit our party of four adults, two teenagers, and a small yorkie! The view was gorgeous! Morning coffees on the patio was nice! I honestly have nothing negative to add about this home. It was everything we were looking for and then some. 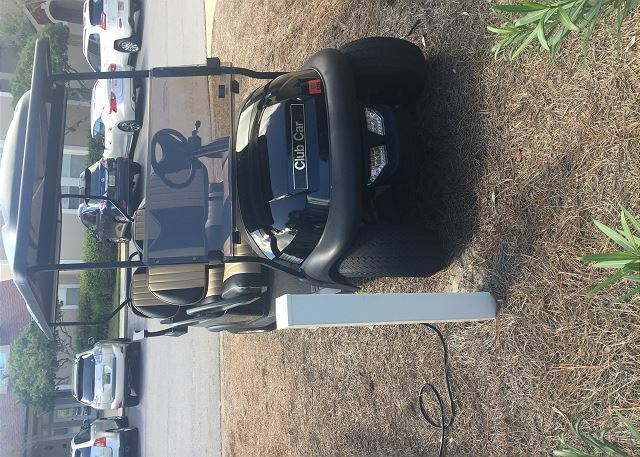 Parking was a little tight, but not a big deal. We had an amazing time! 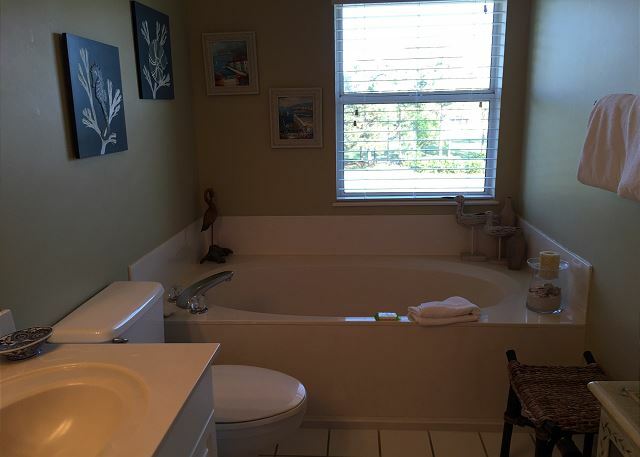 Thank you VRBO! I had not been able to see my children and grandchildren for a tear. This meant a great deal to this grandfather. The weather was good the the ocean inviting the pool cool o hot days the seafood fresh. The condo was large enough for our crowd. Very clean and complete. Michael- I am so happy Destin Memories was able to assist with such a special time! We look forward to hosting your wonderful family again! Thank you for your review. It also was on a very nice gated community. I would definitely recommend this condo. It’s not on the beach, but there’s a bus that takes you over there. Diane, Thank you so much for your kind review. We would love to host your family again. My vacation experience at 8502 Turnberry was great! 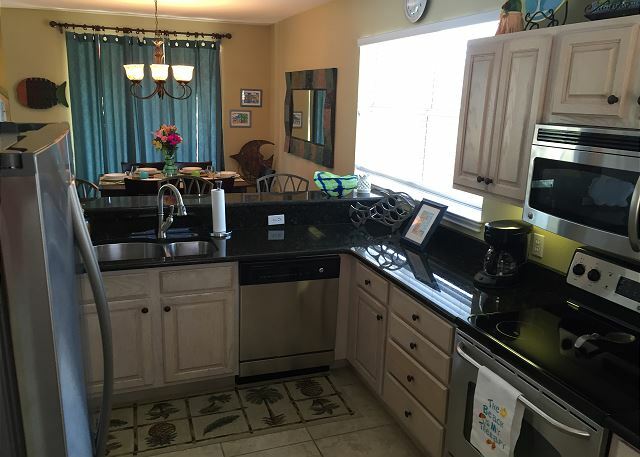 Property was very clean and management company rep was very friendly and helpful. I would highly recommend this place to my friends/family and plan on returning in the near future. Thank you! The condo was very nice. The only downfall is that we were unaware that it was two floor condo. We knew the condo was on the second floor but did not know the floor plan. We probably would not have chosen this condo if we would have known. My husband has mobility issues and having to climb stairs inside the condo was very difficult for him. Aracely, Thank you for your review. It is a really beautiful condo and we are sorry it did not work for you. I noted that you had booked online with VRBO and not with me directly so I was unable to give you specifics. I am always available to answer questions or concerns about our rentals and help you find something with no stairs. I wish you had called me I would have tried to move you to something more fitting, while it is not always possible during the busy season, I would have tried to help. I do hope you enjoyed your stay at the resort and that you will give us another chance! The rental was great. Easily sleeps 6. The condo was quiet and relaxing, and nicely furnished. The amenities inside the resort are easy walking distance from the rental. We would definitely recommend it to anyone. Skylor, Thank you so much for the review. We look forward to hosting your group again! 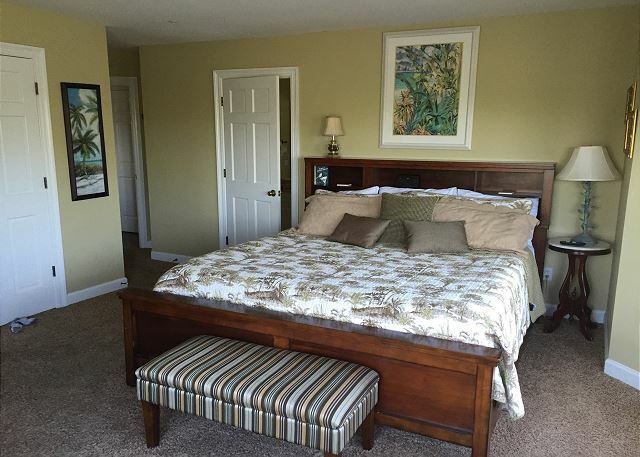 8502 Turnberry is such a cute, comfortable condo! We enjoyed our stay & would look forward to staying here again! 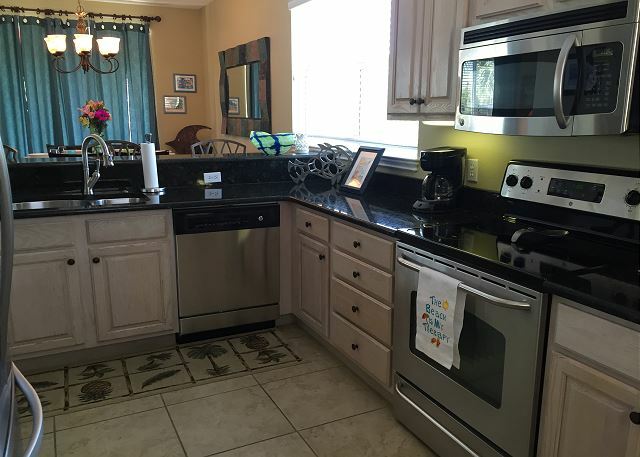 This condo is very nice with all the things you would need in a Florida condo. Furniture and accessories are all in good condition. Very clean. Tina, Thank you for taking the time to send us a review! I noted you gave three stars to location. 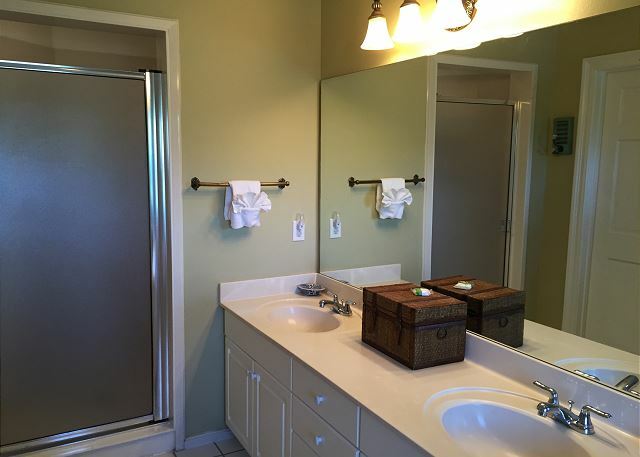 Since you booked online with VRBO maybe you were not in the location you wanted. 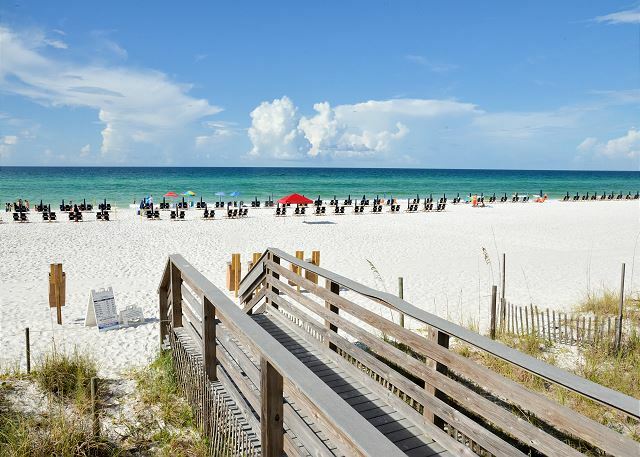 Sandestin is a very large resort with thousands of places to stay! Next year, give me a call and I will help you find exactly what you are looking for- your vacation is important to me. Thank you again for staying with us. a guest from Springfield, IL does not recommend this vacation rental. This condo is in the perfect location. The views are great and everything is so close. Unfortunately however the interior of this unit is very tired. It needs refreshing big time. The master bedroom bed is so uncomfortable we had to sleep in the other bedrooms. Needs a deep cleaning as well. Carpet in living area is BAD. Dear Michelle, Thank you again for staying with us again this winter and taking the time to review the condo. The owner of the condo is always upgrading and making changes. We have an excellent cleaning team and while we are not perfect we are always available if our guests find an issue. I wish you had called me on the 24/7 Helpline about this. We would have sent someone to you immediately if you had found something lacking. 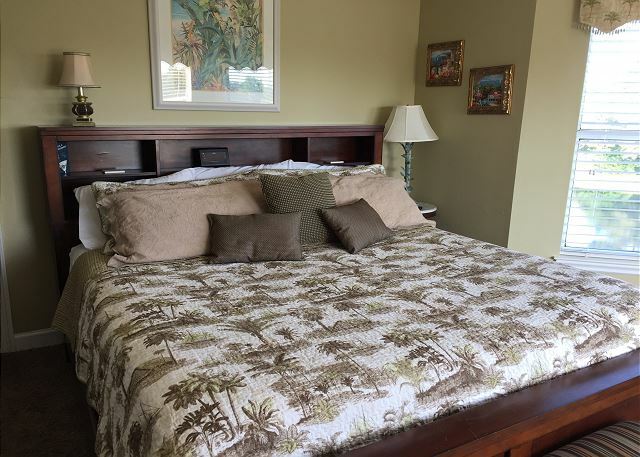 All of the mattresses were replaced recently and this is one area where it is hard to please everyone- too hard, too soft is always an issue in vacation rentals. I also wanted to thank you for sending your friend to us for next winter. We will take good care of him and make sure he has an enjoyable winter. Thank you again for your review and travel safely going home! 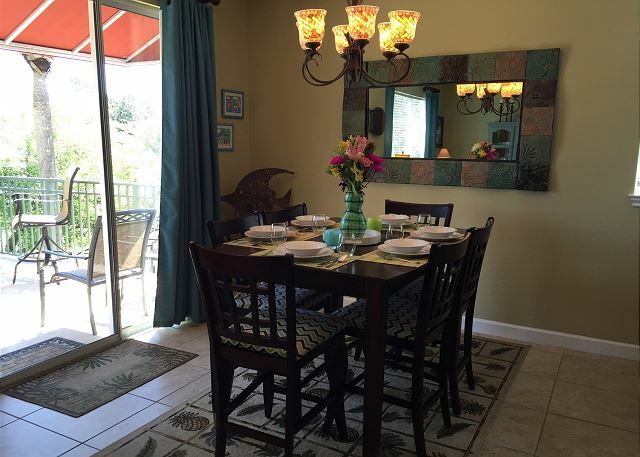 We enjoyed renting 8502 Turnberry. It was spacious and centrally located. This was our second year renting this unit and will rent again in the future. April, Thank you for the review. We love have you and your family during the holidays and look forward to your return. This was our fourth time staying at 8502 Turnberry. 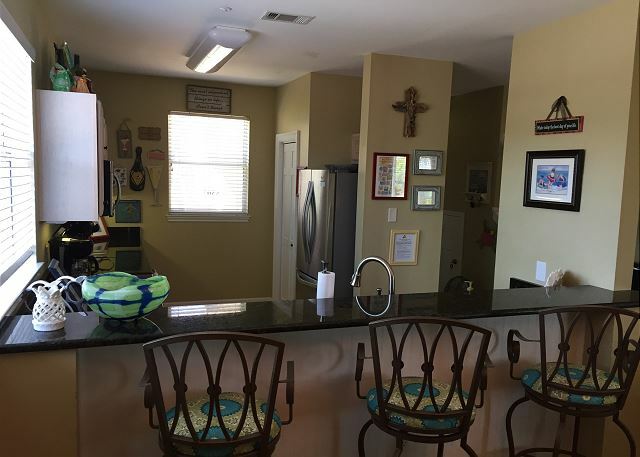 The location is convenient to both the pool and to the Baytowne Wharf. 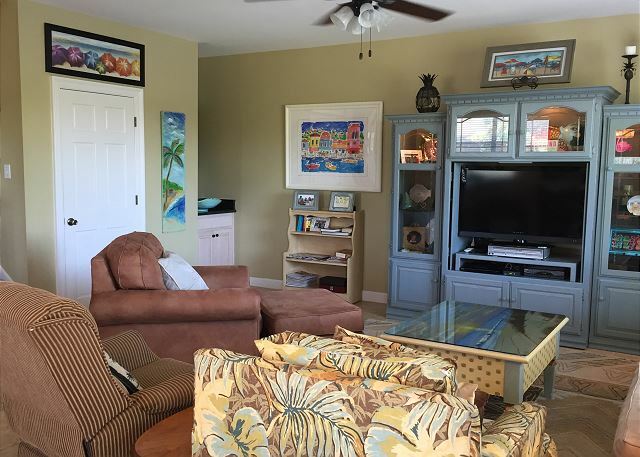 It is a short commute to the beach and free shuttle service is available. 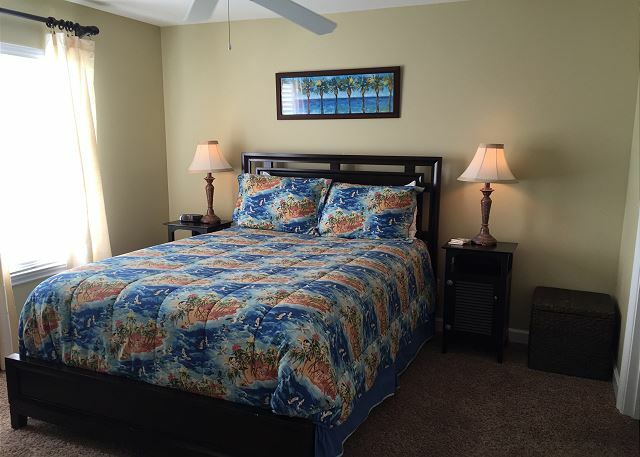 The condo is furnished very well and we have always found it to be very clean and in good order. It is an upstairs residence so be prepared to climb some stairs but the view from the balcony makes it worthwhile. Phyllis and others who manage the property are very helpful. I highly recommend. Larry, Thank you so much. It is always a pleasure to have your and your family stay with us. We look forward to your next visit! This is a perfect spot for true relaxation. Overlooking the pond every morning, right next to the golf course. Typically there was a nice breeze blowing the entire stay. Pool is literally across the street. 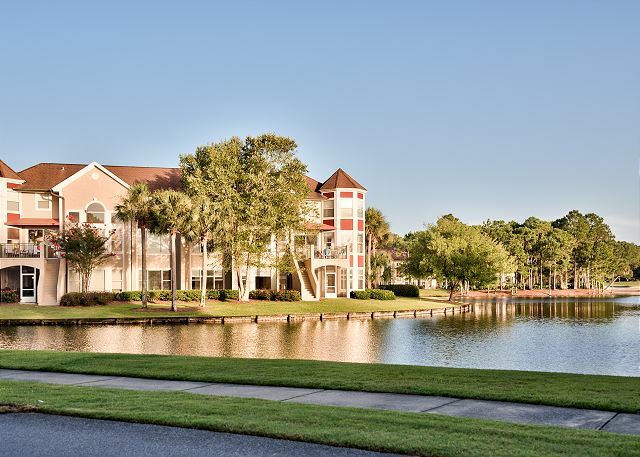 Baytowne is a short walk for convenience. My only complaint would be the parking situation, it can get a little tough to find a spot when all the surrounding units are occupied. Other than that, great place to stay especially for the cost. You get way more than you expect for the price you pay. We are a family of 5, with 3 boys all grade school age. We absolutlely loved the condo! It was very clean, spacious and had all the amenities we needed to enjoy our trip. We also loved the fact that there were so many activities to do at the resort. We went bike riding, and were able to enjoy walking to dinner and to the arcade and other shops. 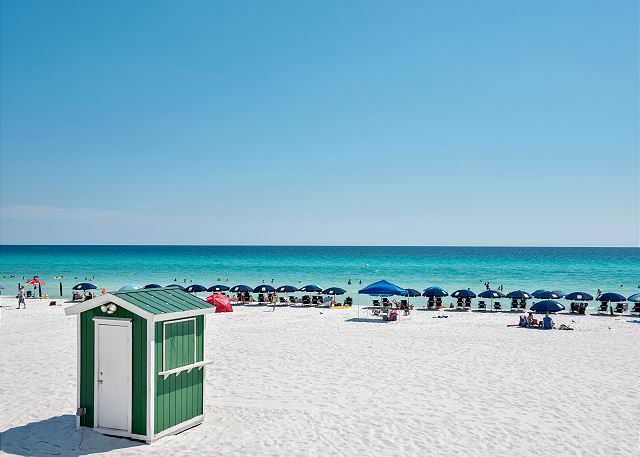 This was our first time visiting Destin, and based on our experience, we will DEFINITELY be back!! I would highly recommend 8502 Turnberry when visiting the Destin area. 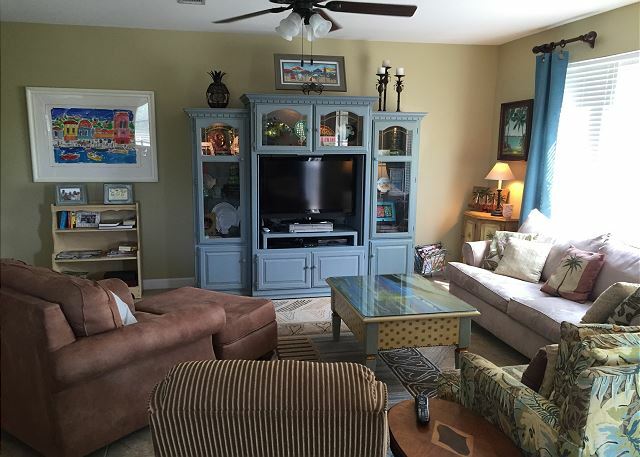 We are so happy that you enjoyed the condo and your stay her in the Destin Area. Making Happy clients is why we get up and do our jobs. Your review of this condo is very much appreciated. We would love to work with you when you guys come back and look forward to have you and your family with us again!! Really loved the townhouse. Very clean, comfortable and nice. 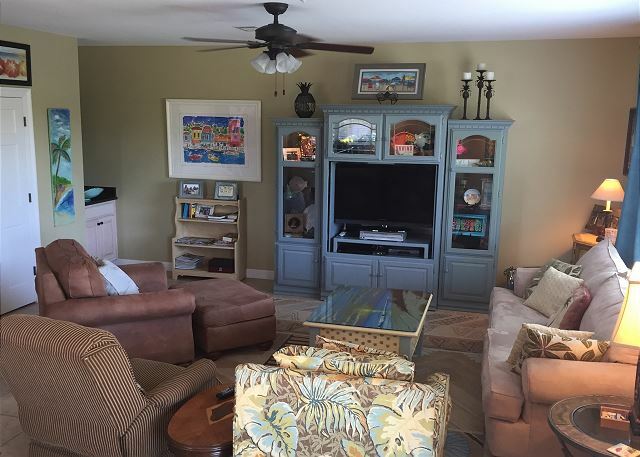 Nice location in Sandestin with beautiful view of lake. Loved the comfy cozy decorating style. Will definitely stay there again. Cathy, Thank you so much for your kind words- we look forward to hosting you and your family again. Phyllis at Destin Memories could not have been nicer. So kind and professional and a wonderful person to work with. Decor not up to date, furnishings need work. Location is the best! We love it here and are coming back! 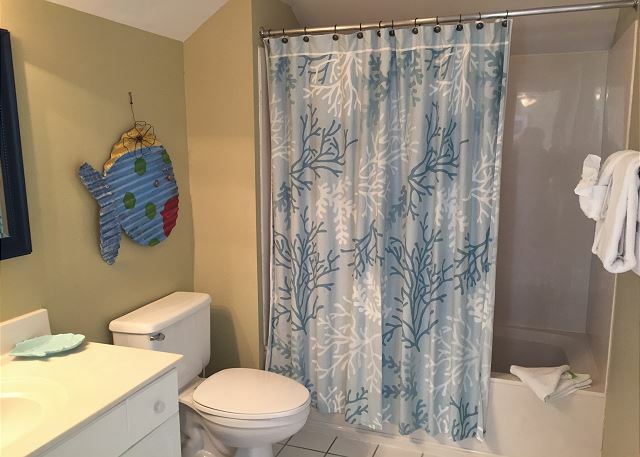 Clean, comfortable, tastefully decorated, welcoming rental. The condo was beautiful and had a fully equipped kitchen. Pet friendly was an added bonus for our small dog. The view of the lake was nice too. The walk to Baytowne wharf was a short 7 minutes and saved the hassle of bringing a car there. Only two issues...if you have ederly staying the stairs can be a problem. There are many stairs into the second floor condo and then again to get to bedrooms. Also, the unit did not heat the first floor very well. Of course, heat is rarely needed but this time of the year we did need heat. We would definitely stay again!! !